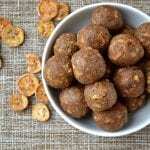 I have to apologize for posting two Energy Ball recipes in less than 10 days. I had planned on holding this one back for a few weeks to give you time to try the Coconut & Ginger recipe from last week, but these Apple Pie Energy Balls are just too good to keep to myself. I think the key to success on any sort of diet (other then determination and will power of steel) is to always have healthy, ready-made snacks on hand. In today’s world most household cupboards are filled with sugary cereals, crackers, chips and cookies, all processed foods which are a little too quick and easy to eat. I used to rely heavily on nuts to curb my hunger between meals which although high in protein and other good nutrients, may not have been the best option for my waist line. 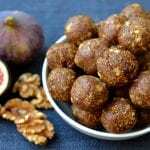 My solution – the Energy Ball, my new snacking obsession. A batch can be made in less then 10 minutes, they are nutritious and filled with protein so you stay full for longer and they last for months in the freezer, all attributes which more then make up for the way they look. 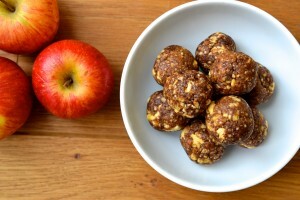 These balls really do taste like apple pie which makes them one of my favorite ‘light desserts’, or pre-breakfast breakfasts, or pre-workout snacks; I will use just about any excuse to eat one. 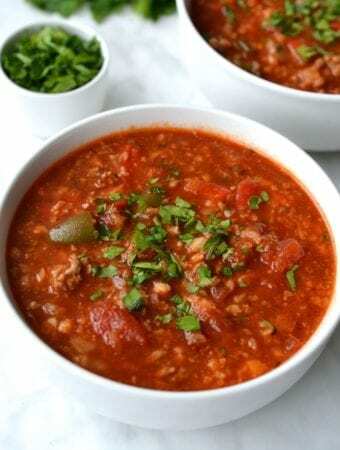 I make a big batch of these and store them in the freezer in a ziploc bag where they can last for up to three months. I think they are best eaten frozen, straight from the freezer but they can also be stored in the fridge. I hope you enjoy! Add the nutmeg, cinnamon and toasted pecans and continue to blend until the pecans reach your desired size. Haha it’s all healthy ingredients so don’t feel guilty! Depending on the size etc, each ball is approximately 30 calories. Hope that helps! Personally, I prefer the texture of the balls when they are kept in the fridge or freezer, I think the flavours are stronger and they have a much more firm texture. With the exception of the ginger energy balls and key lime pie energy balls which both have fresh ingredients, the other recipes should all last just as long on your counter as they would in the fridge. Are you sure the quantities in your recipe are correct? I made these and they are mostly apple, tiny bit of date, whereas your picture is the other way around. Cat, I haven’t tried these yet but I too was wondering about the quantities. It seems like 2 tablespoons of cinnamon is a lot – did you use 2 tablespoons per the recipe and did the balls turn out well apart from your issue with the apple vs date ratio? wuaaaahh! that looks amazing! can’t wait to try them! do you dry the apples yourself or do you buy dried ones? would it also work with fresh apples? I buy naturally dried apples with no added sulfur dioxide but you can also dry them yourself if you have a dehydrator. I would stick to using dried apples for this recipe as fresh are packed with so much liquid it would change the consistency of the balls. 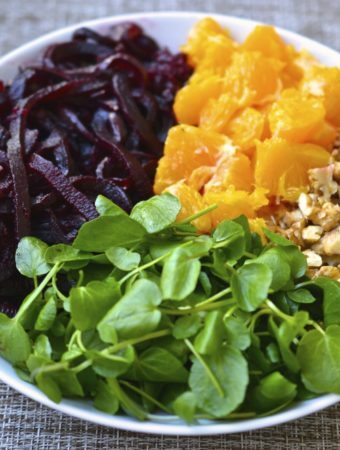 Can I use any other dried fruits besides the dates? Cranberries, poms etc? As for the question on using fresh apples, you can grate them like cheese, soak in lemon water for 30 min, then drain & pat dry, bake @ 200f for an hour, shake the pan then bake for another 1-2 hrs, let cool at room temp. You have dried shredded apples! I did this for a topping on a apple tart. Where would I find the nutrition info for these. Hi, would it work with fresh apple instead of dried apple ? Hi Laurence, unfortunately I have never tried this recipe with fresh apples. I imagine that the balls would be quite wet so you may need to increase the amount of walnuts to absorb the excess liquid. I think grating the apple on a cheese grater and then leaving it to rest between paper towel for a few minutes may help. Let me know if you try it! I made them with fresh apples and they were indeed waaaay to wet. I tried making balls and refrigerating them, but I think I’ll try adding protein powder and re-rolling and then freezing. Any other suggestions? 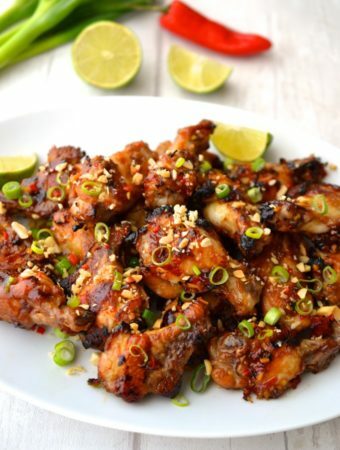 Good idea, storing them in the freezer will help them keep their shape, I also think adding in a few tablespoons of almond flour should help absorb some of the excess moisture. I tried a similar recipe that called for fresh apple. They did not turn out so well and were not a favorite here at all. It was wet indeed. I like this one and will be trying it. I will dehydrate apples in my oven tonight and in the morning make these. Thanks for the feedback Elicia, thats very good to know! 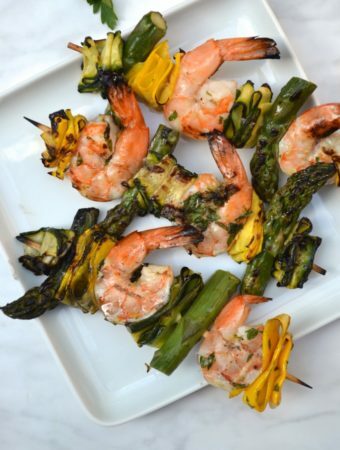 I hope you have more success with this recipe! Do you by any chance know the amount of protein, fiber, etc. in these? 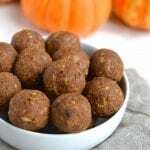 Hi Rob, unfortunately I don’t usually calculate the nutrition for each recipe but I believe each ball is approximately 25 calories and contains 2g fibre and protein. I dont use protein powder but if you wanted to increase the amount of protein in each ball you could add a scoop into the mixture before rolling the balls. I make the Nutty Energy Bites every week. They have replaced the processed protein bars that we used to buy. For variety I’m trying the Apple Pie Bites this weekend. I hope they are as big of a hit as the nutty ones are! Thank you for sharing! 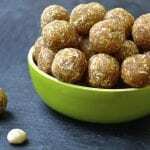 Hi Ginny, natural energy bites are a great alternative to processed protein bars, they are so much healthier! I hope you enjoy these apple pie ones! I also have recipes for coconut & ginger, fig newton and banana bread energy balls posted on the site which are all delicious. I hope you enjoy! Can’t wait to try it, it sounds amazing! I can’t wait to try these. I’m always looking for another healthy snack as I begin this whole healthier living because I’m over thirty journey, lol. My wife and I will surely enjoy them! Good luck with the start of your healthy living journey! 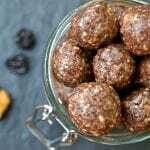 It gets easier the longer you stick to it and these energy balls will definitely help during those sweet tooth moments. Hope you enjoy them! 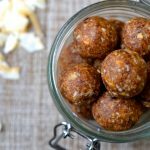 I made your coconut & ginger energy balls last week and my husband who is training for a marathon absolutely loved them as a snack before his runs. I’m sure these will also be a big hit! 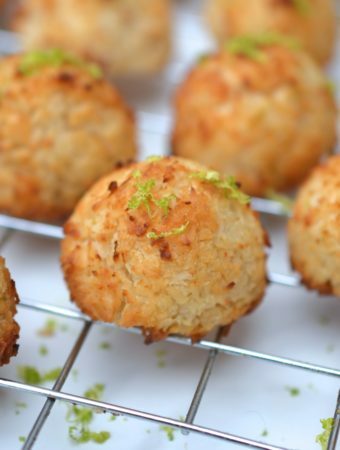 I’m so glad your husband liked the Coconut and Ginger Balls. Once you make these I would love to hear which one he prefers.